I read Sarah Ditum's piece at The New Statesmanearlier. I've often wondered, how parents do this - how they make the choices they do about it. My own mother read me The Diary of Anne Frank when I was six or seven, and that was my introduction. It's always been a part of my awareness, the first bit of history to exercise a fascination for me. 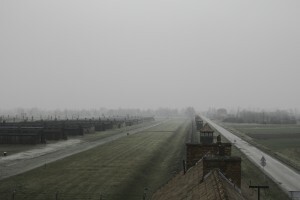 Anne was followed in books by Judith Kerr's When Hitler Stole Pink Rabbit, Ian Serraillier's The Silver Sword, by I am David, by A Square of Sky, The Hiding Place, Schindler's List and ultimately, by If this is a Man, and by visits, while travelling, to Dachau, to Auschwitz, to Sachsenhausen. I wanted to know. As if by knowing I could understand. But now. One of the responsibilities, I think, of getting older, is learning how to hold things without trying to extract meaning from them. Of failing to understand and living with that failing because you are not the answer and you cannot make it better. A few years ago, I was in Berlin, where I saw the Holocaust Memorial. It doesn't have a single meaning, or a truth. It just is. A field of individual stelae, a collective mass of stones and history. There are a hundred routes straight through the field, or there's a maze. You stand in it, you can touch it, but for each bit you touch, you miss another. It's dislocating and chilling - especially in the snow. The day I was there the sun was starting to melt the snow that had settled on top of some of the stelae, with water droplets running down the sides of the blocks like tears.